The Behringer V-Amp 3 is an powerful, affordable modeling processor. With plenty of amps and effects, the Behringer V-Amp 3 will expand your tonal horizons. If a lack of money and floor space is all that's been standing between you and a home recording studio full of badass vintage guitar amps and eff ects pedals, get ready to love the V-AMP 3. This red rocker comes loaded with 32 amp models, 15 speaker cabinet models and 16 classic effects. But that's only the beginning -- you also get the UCA222 USB audio interface and free energyXT2.5 Compact software. In short, the V-Amp 3 gives you the power to start recording a molten magnum opus in no time! Hook the V-Amp 3 up to your computer using the included 1/4-inch TRS-to-RCA cable and UCA222 USB interface. Connect V-Amp 3 Phones output with the stereo line inputs of UCA222, and switch its direct monitoring function on. Then connect the UCA222 USB cable to your computer. You can monitor the signal with the UCA222's headphone jack. (This is also a great way to jam along with the MP3's on your computer). From there, the amazing energyXT2.5 DAW (digital audio workstation) makes it easy to manipulate your audio and MIDI files, turning song ideas into stunning CD or web-ready recordings. energyXT2.5 includes its own multi-FX processor, built-in synthesizers and a drum machine, both of which can be accessed by any controller keyboard, such as the UMA25S or UMX series, or programmed in step-write mode. The V-Amp 3's 32 amp models are organized into four groups: Clean, Blues, Metal and Rock. Just twist the dedicated dial to plug into unbelievably authentic simulations of the greatest British and American tube amps from the 1950s to today. You even get models of uncommon -- yet renowned -- boutique tube amps! When you select an amp model, a speaker cabinet model is automatically selected. But if you'd prefer a different model, just go to Edit>Cabinets, then use the Bank Up/Down buttons to navigate through all 15 options. Just like on an actual guitar amp, you've got a three-band EQ, Gain, Reverb, Volume and Master Volume dials. By holding the Tap button, the Treble dial becomes a Presence control. This enables the adjustment of a high-frequency filter that can add or remove a "shimmer" from the V-Amp 3's tone. The V-Amp 3 gives you fl anger, chorus, compression, delay and 12 other beautiful digital effects to apply to your sound. Adjust the effect's level in the mix via the Effects dial. To adjust effect parameters, you can rhythmically press the Tap button to alter delay times or LFO speeds, or hold down the Tap button and twist the Effects knob to access e.g. feedback or depth. By using a MIDI pedal, such as the Behringer FCB1010, you can access an additional Wah Wah effect. You can adjust the filter characteristic by entering Edit mode, selecting the Drive menu and turning the Effects knob while holding the Tap button. All of these elements have been combined into 125 different presets divided into 25 banks, accessible through the Bank Up/ Bank Down buttons. Within each bank, you can press buttons A through E to explore its different presets. You can also create and save your own presets. Start by selecting a preset, then making any changes you wish: amp, EQ, effect, etc. The preset LED will begin to fl ash, indicating that the V-Amp 3 is ready to save your settings. To do this, hold the preset button down for about two seconds. Once the LED stops fl ashing, you have saved the modified preset. On top of all this, the V-Amp 3 also features a built-in tuner and noise gate. In essence, it's a Swiss Army Knife for the home recording enthusiast or gigging guitarist who can't seem to settle on one amp. The V-Amp 3 features several configurations that make it an invaluable asset in the studio. Access the configuration menu by pressing the B and D buttons at the same time. Then use Bank Up and Bank Down to select a configuration. When using headphones, the V-Amp 3 will switch into Studio Mode 1 (S1). This stereo mode works well for both monitoring and recording with effects, amp and speaker modeling. It doesn't apply the additional three-band EQ to the signal, but most recording programs -- like energyXT2.5 -- have their own EQ. In Studio Mode 2 (S2), the V-Amp 3 sends a signal with amp and speaker simulation, but only the right output has effects. You can either record both left and right outputs to separate tracks, or record the "dry" left output while monitoring the right output. 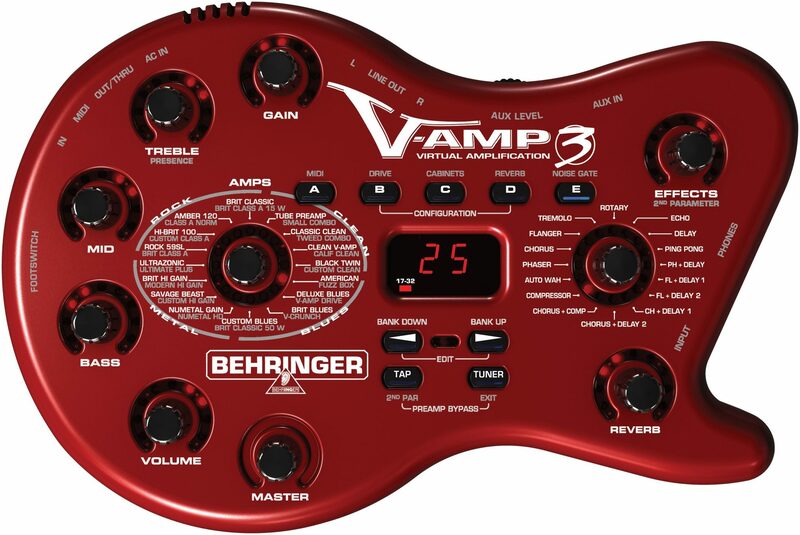 The V-AMP 3 has three live configurations. When performing live with this device, you can either run it to an amp on stage, run directly to the mixing board, or both. Live Mode 1 is the best choice for running the outputs directly to the mixer, because it applies amp and speaker simulation, effects and an additional 3-band EQ. Use Live Mode 2 to run the V-Amp 3 into the effects return inputs of 2 different guitar amps. This configuration does not feature speaker simulation, allowing the amplifier's natural speaker sound to go unaltered. In this scenario, the amps would be mic'd on stage to get the sound to the house speakers, and having a dedicated monitor would be less important. In Live Mode 3, you can send the left output to an amp's effects return for onstage volume, while the right output sends signal to the main mixer for inclusion in the main house mix. Also note that you can press the Tap key while turning the Gain knob to adjust the input sensitivity to match the output of your guitar's pickups. If the Clip LED lights, the input's sensitivity should be reduced. 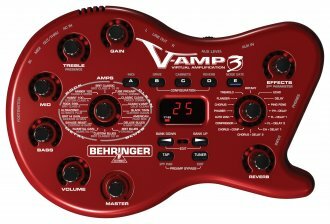 The V-Amp 3 comes fully equipped to fit right into a MIDI (Musical Instrument Digital Interface) setup. It can be controlled in real time from a computer, or via a MIDI foot controller during a live performance. Its MIDI connectors are international-standard 5-pin DIN connectors. You will need dedicated MIDI cables (not included). The MIDI In jack receives MIDI controller data. It can be adjusted in Edit mode by pressing the A button and then using the arrow keys. MIDI Out/Thru sends data to a computer. You can transmit both preset data and parameter changes. Some people even use the V-Amp as a remote control for parameters of their DAW or VST instruments, which is more handy than using the mouse alone. If set to MIDI Thru, the V-Amp 3 does not send its own MIDI information, but passes on the signal received at the MIDI In connector. It's hard enough finding another virtual guitar amplifier with this much versatility, let alone one as economical as the V-Amp 3. This go-anywhere, do-anything wonder will leave you reeling in your own creativity, with cash to spare for other gear you'll need along the way to becoming a sonic titan both live and in your home studio.